There are luxury waterfront houses down by the beach of course, but as you go uphill you'll notice a mix of modest "BC boxes" as well as a lot of older and newer custom homes. The southern half of the region (Cilaire and Beach Estates, and the area around the Nanaimo Golf Club - see my map below) features larger parcels with homes built in the 1950s-1970s. 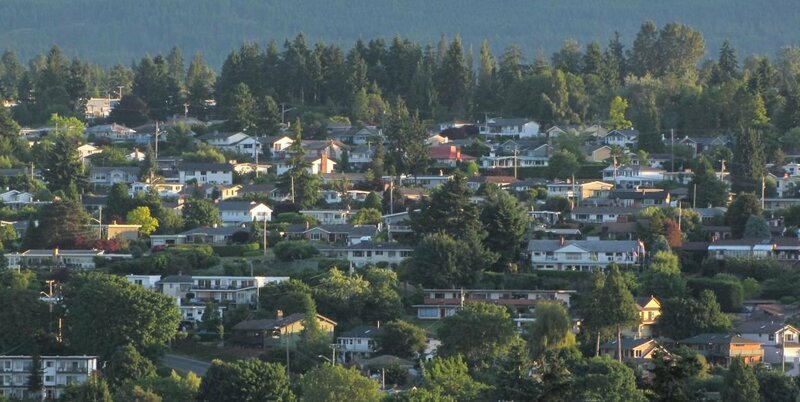 The northern part of Departure Bay is more rocky and has 1960s-80s homes built in the peaks and ravines - it's called "Sherwood Forest" and the streets are named accordingly (Prince John Way, Marion Way, Bowstring Close). Of course, there are also many newer homes, especially higher up on the bluffs. Need help buying or selling in Departure Bay? Contact me. The first telephone line in British Columbia was installed here in the 1880s - it ran from the wharves at Departure Bay up to the coal town of Wellington (now part of Nanaimo, between Diver Lake and Long Lake). One of the mining engineers assembled the telephone system based on instructions he saw in a science magazine.